Students who live on campus are closer to their classes, the library, computer labs and other facilities. Campus residents are more involved in student organizations and often have higher GPAs. 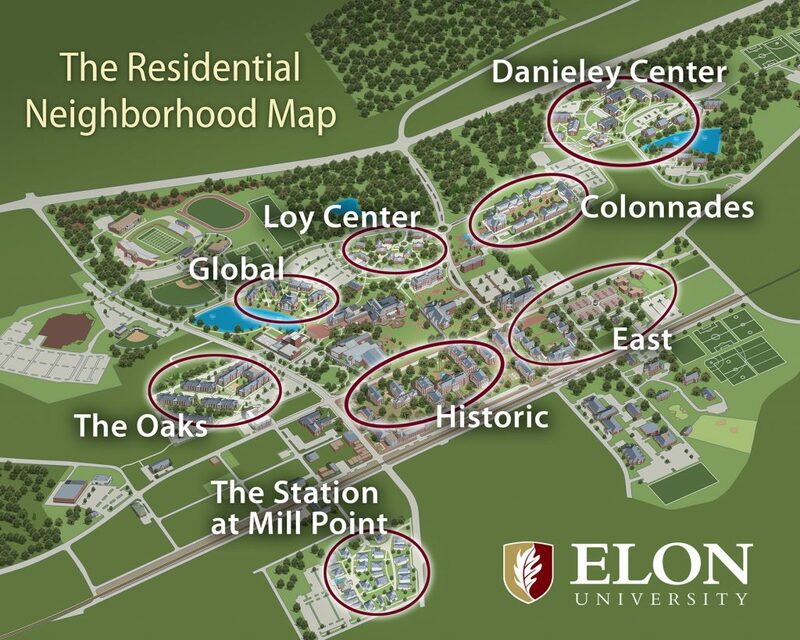 Elon’s residential campus includes eight different neighborhoods. Each neighborhood offers a unique experience, with a cluster of residences and common spaces that form intimate communities of students connected by a common set of themes and shared interactions. Each neighborhood is led by a leadership team of faculty, staff, and student peer mentors. Each community is governed by a neighborhood association made up of student resident representatives and faculty and staff from across the university. Click on a neighborhood in the descriptions below for more information about the programs and features of that neighborhood and the faculty and staff who live there. Students from all four academic classes live together “on the geo” in communities surrounding the geothermal field adjacent to the Koury Business Center. In the coming years, we envision this neighborhood’s programs and experiences will increasingly support Elon’s commitment to sustainability. Some first-year students and many sophomores live in 8-10 person flats and 4-person apartments around Lake Verona, with leadership and wellness as the neighborhood theme. Civic engagement and social innovation is the theme for this new neighborhood, constructed in 2018. The majority of the students in the neighborhood are first-year students, many of whom are committed to being change agents and leaders in social and civic innovation. The neighborhood will open to students at the start of the fall 2018 term. The international theme of world cultures and languages is the focus of this neighborhood on the shores of Lake Mary Nell. The majority of the students in the neighborhood are first-year students taking the Core Curriculum global experience course together. In the core of the original campus, first-year students live in the traditional Elon College residences with the theme of Elon traditions and history. Many of these students enroll in the first year English or Math Core courses together. Headquarters for fraternities and sororities, with a leadership & service theme. Juniors and some sophomores live in apartments between the Fine Arts Center and Elon West, and focus on Elon Experiences – study abroad, internships, leadership, service, undergraduate research. Seniors and some juniors reside in apartments in a self-governed community as they complete capstone courses, and prepare to engage in careers and experiences, and to be Elon alumni.